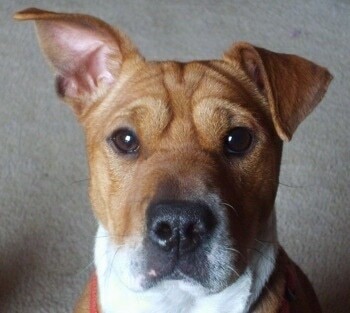 "Sugar Baby Pointer is my one-year-old female Sharbo (Boston Terrier / Shar-Pei hybrid). She was the only fawn-colored puppy in the litter; the rest were black and white like Boston Terriers. Sugar has more characteristics of the Shar-Pei and weighs approximately 18 pounds. She likes to ride on a motorcycle for fun. She loves stuffed animals. She likes to exercise and loves to sit on my lap. She also gives hugs and kisses, and will protect the people she loves. She does not have any health problems." The Sharbo is not a purebred dog. It is a cross between the Boston Terrier and the Chinese Shar-Pei. The best way to determine the temperament of a mixed breed is to look up all breeds in the cross and know you can get any combination of any of the characteristics found in either breed. Not all of these designer hybrid dogs being bred are 50% purebred to 50% purebred. It is very common for breeders to breed multi-generation crosses. A litter of black and white Sharbo puppies at 4 weeks old"The pups mother is a Boston Terrier and their father is a Shar-Pei. There are 5 males and 3 females. We were amazed that she had so many and that they are healthy, and that she came through it all on her own. Although # 8 (in the middle) wasn't breathing when he was born, with a little help he came around, now he is perfect. Numbers 6 and 7 (girl and boy) are twins. I had never seen that before with dogs, but was surprised when they were born." Sinatra the Miniature Shar-Pei, Boston Terrier mix at 11 months old—Sinatra is a Sharbo, comes from a pure breed Miniature Shar-Pei (father) and Boston Terrier (mother). We bought him as a puppy as soon as he was ready. He has a very playful temperament. After he runs around the back yard or goes for walks he is very relaxed. He likes to play and cuddle. He is an indoor/outdoor dog and is very sociable and friendly. He will bark at strangers once he gets acquainted. He plays with rope, and tennis balls. He sits and lays down on loose leash-walks. we have taken him to puppy classes for obedience training. It made a difference. He is a very active dog likes to run around in the back yard, go for walks and car rides even boating. loves bacon! Sinatra the Miniature Shar-Pei, Boston Terrier mix at 11 months old out on a boat wearing a life vest. Tootsie Bear the Shar-Pei / Boston Terrier mix as a puppy at 11 weeks old—"Tootsie Bear is the baby of our dog family. She has two older sisters, Tifi and Paris. Tifi is a Yorkie and Paris is a Snorkie (Schnauzer/Yorkie). Tootsie is so full of energy while playing indoors, but when it's time to go for a walk, she does her 'business' and immediately after wants to be carried. She's such a lazy puppy. She's sweet and lovable and friendly with everyone she meets. We've had her for a month now and she's such a joy."